Use the subscribe method to pay your membership dues and your credit card will automatically renew annually. By becoming a member of Jazz Unlimited you will be part of a community of jazz lovers and musicians. Jazz Unlimited is a non-profit organization run at minimal cost by member volunteers, with the vast majority of its budget going to support its musical activities and Scholarship prizes. 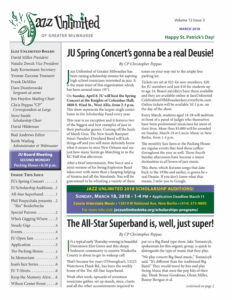 Mailed monthly newsletter, providing valuable information with a calendar of events and community interest stories. Performing members and host of outlets provide opportunities from sit-in jam sessions to concerts. Jazz Unlimited Members may also display a link to their website on Jazz Unlimited’s site for promotional purposes. Help development of local talent through the annual scholarship program. Aspiring high school students compete for $4,000 in six categories. The winners showcase their talents in an amazing spring recital! Support renowned international competitions for emerging professional wind, percussion, pianists, singers, and composers through the Douglas M. Gmoser, Chuck Hedges, and Jazz Camp Scholarships. Providing performing members a host of outlets, including sit-in jam sessions to concerts, for their talents with generous support of local venues as well as a listing of performance anouncement in the events page of monthly newsletter. Development of local talent through the annual scholarship program. Aspiring high school students compete for $4,000 in six categories. The winners showcase their talents in an amazing spring recital! Renowned international competitions for emerging professional wind, percussion, pianists, singers, and composers through the Douglas M. Gmoser, Chuck Hedges, and Jazz Camp Scholarships. Mailed monthly newsletter, providing valuable information with a calendar of events and community interest stories. Jazz Unlimited relies on modest annual dues, augmented by contributions, to cover postage and newsletter production expenses. Patron/jazz club and corporate membership are provided with free ads in the newsletter and opportunities to host events and sponsor events. Members are required to pay yearly dues and to keep their accounts up to date with a timely payment of yearly dues as well as current address, phone number and email address. Failure to renew membership with timely payment of dues will result in loss of membership privileges and discontinuation of receiving the monthly newsletter. Membership renewal date is printed on the mailing address label of newsletter. To apply for membership use the link in the sidebar on the right or on every page in the sidebar. You can also submit a hard copy of your registration form using the upload function below. For questions about membership contact Yvonne Zarcone. Use either PayPal for secure online payment or by regular mail by downloading the forms using the links and mail in your application and check. membership dues with "Subscribe", your credit card will automatically renew annually. membership dues with "Add to Cart", your credit card will not automatically renew. Download and complete the membership form click here. Click PayPal Charityhere to make you donation. Click here to make you donation. When you shop @AmazonSmile, Amazon will make a donation to Jazz Unlimited of Greater Milwaukee. Maintained by Watling Design. Copyright © 2016 Jazz Unlimited. All rights reserved.